Sweeney: "The strike hurt us a little from a flow standpoint. We're starting to recover that." DETROIT -- General Motors is beginning to replenish inventories of the 2018 Chevrolet Equinox after a monthlong union strike at the Ingersoll, Ont., plant diminished supplies of the crossover. The plant, following the resumption of output Oct. 18, is running on three shifts, six days a week, according to a company spokesman. 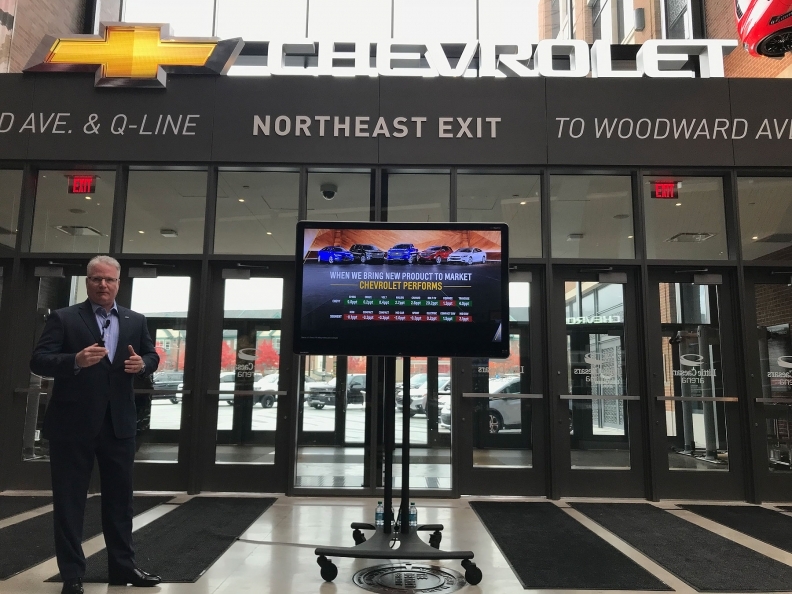 "We're a little tight on supply right now, but manufacturing's doing a phenomenal job of getting a lot more product built for us," said Steve Majoros, director of Chevrolet marketing. "Demand is high, and production is going along full speed." GM also produces the Equinox at two plants in Mexico; however, the main source of output is CAMI. Days supply of the redesigned compact crossover in the United States are "just north of 40," according to Brian Sweeney, U.S. vice president for Chevrolet. Days supply isn’t available in Canada. "The strike hurt us a little from a flow standpoint," Sweeney said Monday during a media event here. "We're starting to recover that." Sweeney said the strike reduced Equinox supplies to as low as 36 to 38 days. GM CFO Chuck Stevens previously said GM lost about 20,000 units because of the Unifor strike, which idled the company's CAMI assembly plant, beginning Sept. 17. GM had an estimated 39-day supply of Equinox crossovers to begin November, according to the Automotive News Data Center. Estimated inventory was 40,000 vehicles -- about 9,000 above the five-year low of 30,900 Equinox models in August 2012. GM, Majoros said, plans to "have the pipeline filled quickly" for Equinox. He added that some markets may feel a greater "pinch" than others but that the company still hopes to meet 2017 U.S. sales objectives for the Equinox, without offering specifics. Over the weekend, Chevrolet launched a third chapter in its national TV advertising campaign for the Equinox called "Add It Up." The 30-second spot benchmarks the crossover with competitors by piling the vehicles up in a pyramid to the Equinox. It is a continuation of the brand's well-received "Real People. Not Actors" campaign featuring customer reactions. U.S. sales of the Equinox are up 23 per cent to more than 238,000 through October, including 25,272 vehicles, up 29 per cent, last month. Canadian sales are up 34.1 per cent to 20,657 units through October. The Equinox has been a driving force behind the 14 per cent gain in Chevrolet's U.S. sales of crossovers through the third quarter. Chevrolet's overall U.S. sales through October have slipped 1.3 per cent to nearly 1.7 million vehicles, mostly on weaker car demand. In Canada, total Chevy sales are up 17 per cent. GM's overall sales in the United States are down 0.9 per cent to more than 2.4 million vehicles this year. They’re up 17.5 per cent to 259,413 units in Canada. In the presentation Monday, Chevrolet officials said they were on track to increase U.S. retail market share for the third straight year. Sweeney said Chevrolet plans to finish the year strong. "We expect a great year," he said. "We come to win every day."